One of the objectives of the class was to become a Life Science Center of Excellence for the National Science Foundation Innovation Corps. This meant capturing domain specific commercialization expertise for therapeutics, diagnostics, devices and digital health so others can teach this. Part 1 of this post described the issues in the therapeutics drug discovery pipeline. Part 2 covered medical devices and digital health. Part 3 described what we’re going to do about it. Part 4 gave a snapshot of what one our teams found the first week outside the building. Each of the four cohorts is taught by an experienced life science venture capitalist. Alan May for devices, Karl Handelsman for therapeutics Abhas Gupta for digital health and Todd Morrill for diagnostics. 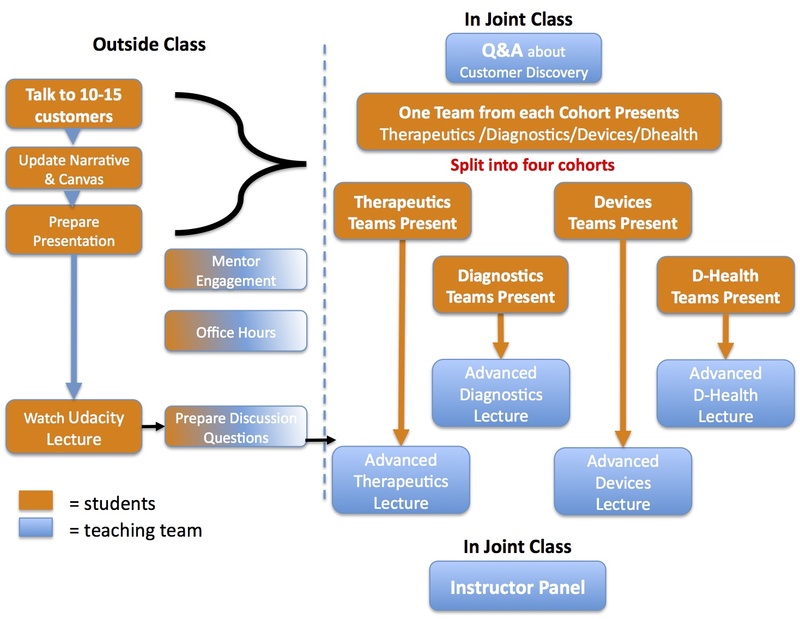 Once we realized that the four cohorts of therapeutics, diagnostics, devices and digital health were so different we decided to have the instructors compare and contrast how they’re different for each part of the business model. We’ll be posting these “compare and contrast” videos for every week of the class. Digital Health Pain & gain = product/market fit needs to be a need, and the value proposition must address it. “Nice to have’s” do not equal a customer need.